Because February is Black History Month, it got me thinking of some of the famous African-American’s who have called Dayton home. Inspiring leaders such as the first internationally recognized African American poet and writer, Paul Laurence Dunbar, Olympian Edwin C. Moses, and creators of the “Funk Music Sound” The Ohio Players and Roger Troutman of Roger & Zap fame. These are just a few of the folks that have put Dayton on the map. One of our very own present day movers and shaker is contemporary artist, educator, and community activist Willis “Bing” Davis. Born in Greer, South Carolina, Bing has studied, lived, and taught in both Indiana and Ohio and graduated from DePauw University in 1959, and then Miami University in 1967. He studied locally here at the Dayton Art Institute. Davis makes art from found objects and often includes mixed media. He has also worked in photography, drawing, painting, ceramics and sculpture. Art to Davis "is a wonderful way to understand self and to understand others." When The Schuster Center announced plans to celebrate Black History Month with programs, concerts and exhibits, teaming up with Bing was a no-brainer. Bing coordinated a display in the lobby of The Schuster Center that will be up through the end of March. He created ‘Visual Voices, Dayton Skyscrapers’ which showcases local African-American artists and a variety of art forms. Over the years these artists have highlighted movers and shakers from our community, civil rights leaders and elected officials. It’s become a ‘must see, must experience, must not miss’ event. Here in 2015 ‘Skyscrapers 6,’ Bing asked area artists to identify and celebrate local African-Americans who have excelled in their field and celebrate local African-American visual artists. Artists and their works include, “Billy Strayhorn” – James Pate; “Snooky: Jazz Master” – Clifford Darrett; “Letitia Perry” – Gregg DeGroat; “Mattie Ingram Lyle: Women of Influence” – Yvette Louise Walker-Dalton; “Testify: Dottie Peoples” – Erin Smith-Glenn; “Sharon” – Abner Cope; “RoNita Hawes-Saunders” – Frances Turner; “Harold ‘Lefty’ Martin: Beyond the Finish Line” – Willis “Bing” Davis and “The Physiognomy of Tyrone Geter” – Dwayne Daniel. But there’s much more to the wonderful art pieces in the lobby of the Schuster. Bing’s goal is to provide positive role models for African-American youth and enhance the general community’s appreciation of African-Americans’ contributions to the Dayton and Miami Valley region. This annual event has become so popular it’s been extended through the end of March during regular Schuster Center operating hours. You really do owe yourself a visit to experience this one-of-a-kind Dayton showcase of the best of the best. Just a short trip from the Schuster. 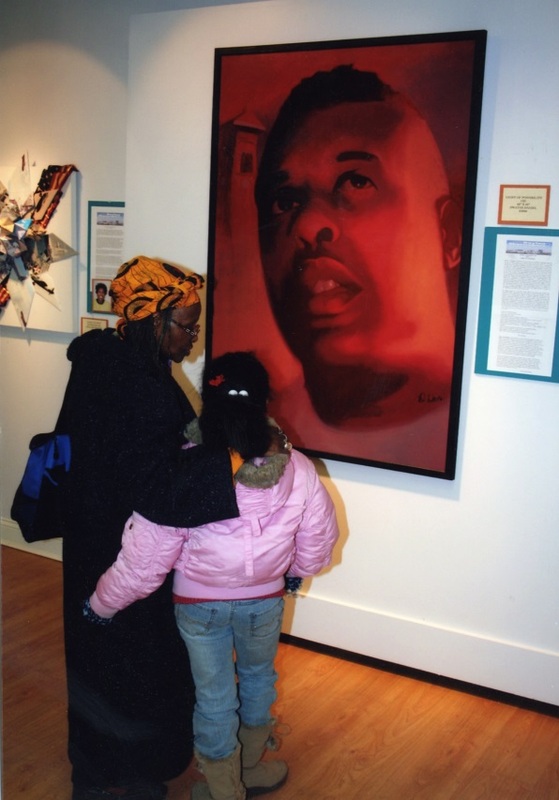 The EbonNia Gallery, named for son Derrick Ebon Davis and daughter Nia Denise Davis, is adjacent to Bing’s studio and it is designed to display and sell their father&apos;s works of art. Bing also makes space available to other emerging, up and coming and established artists to showcase their works. Remember, Visual Voices, Skyscrapers 6 is located inside the Schuster Center, 2nd and Main Streets, in downtown Dayton. Its one of the many ways to celebrate Black History Month.